September 21, 2013--Had the candy bar canvas made into a pillow. I love the chocolate brown and blue fringe--it'll look perfect in my DGD's TV room which is beautifully decorated by my DDIL in blues and browns. Now to decide when to give it to her--at Thanksgiving when we'll next be visiting or in May, 2014, after the Rehoboth Beach Museum's Needlework Exhibit. April, 2013--Ever since my first visit in 2009 to Waste Knot in Arlintgon, VA where this piece was on display, I've always wanted to stitch it. Finally, in 2012, I ordered the kit (painted canvas from Point Of It All and wonderful DMC Perle 5 threads) from Lori Maza, the proprietor. My intention is to have it made into a pillow and give it to my DGD for her play/TV room. 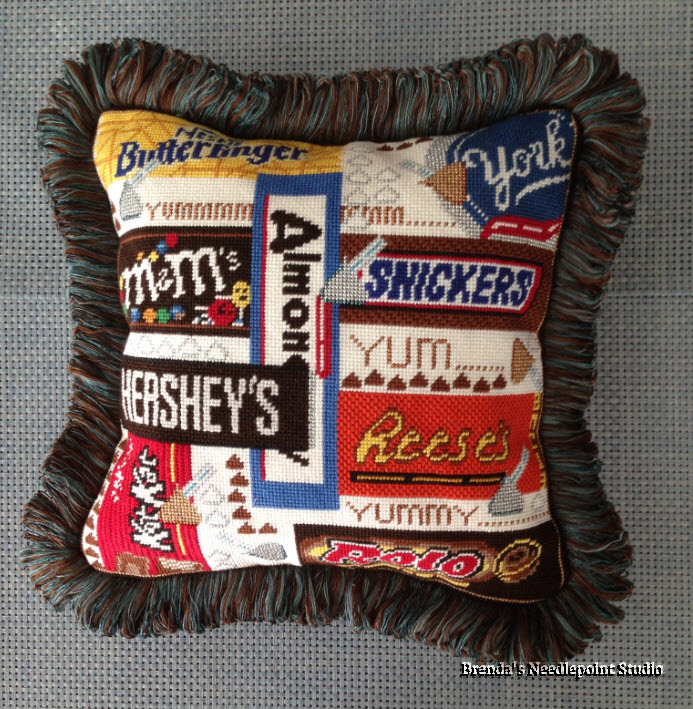 She was visiting this week and helped me finish stitching the canvas by filling in the last 4 little chocolate kisses. Now to shop for backing fabric and some really cool fringe.